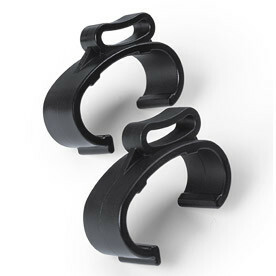 Original Bugaboo under seat basket clips set suitable for the Bugaboo Donkey. Original Bugaboo Donkey underseat basket clips set. This item contains two clips to attach the wire of the underseat basket to the front fork of the chassis for Bugaboo Donkey.